A seemingly innocent and quiet girl, who is devoted to Saionji. She found the book that allows herself and Saionji to be brought into End Earth. Though she wants to follow him, she does not want to be engulfed in darkness, so she develops a dark second personality, one that will do all the things that she does not want to. She becomes one of Baelgard's four guardians, the Hellfire Alchemist, Hildareia. Her alter ego prefers the darkside, and even betrays Saionji by siding with Killrain after he takes over the dark elven army. She often does experiments on many elves, turning them into mindless soldiers for Baelgard. Her dark soul blade is called Mythical Beast Sword Mysteltain. Destroying the evil personality's soul blade is the only way to bring back the original Reia Hiruda. The good personality contains Saionji's Holy Grail, Saionji's Ultimate Soul Blade, which was instrumental in defeating Er Fahren. 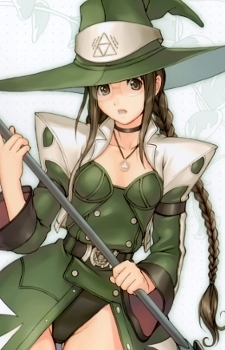 She decides to stay in End Earth, together with Saionji, Xecty, and Jin-Crow in Baelgard, to restore the forest back to its former glory.